Do you experience throbbing, cramping, intense pain in your lower abdomen? Menstrual cramps or period cramps? A dull or constant ache? If so, this video with a yin yoga pose for menstrual cramps is for you. Menstrual cramps are a throbbing or cramping pain in your lower abdomen. Period cramps can be a dull, constant ache or an intense throbbing or cramping pain in your lower abdomen. You may also experience pain in your lower back. You might experience it as an aching pain and a feeling of pressure in your lower belly or a pain in your hips and lower back. According to Traditional Chinese Medicine, where there is free flow of qi (energy) and blood there is no pain. It is the liver in Traditional Chinese Medicine that maintains the free flow of Qi in the body. When there is a restricted flow of qi through the liver, blood stasis occurs and we can experience those painful menstrual cramps. Liver blood stasis also contributes to the emotional disturbances associated with our periods from depression, frustration, irritation, anger, and crying for no reason. Today I am going to show you one yin yoga pose to help the free flow of qi for the liver meridian. Your liver meridian runs along the inside of your ankle, along the inside of your leg, through your groin and goes inside your body towards your liver. Dragonfly or Straddle Pose in Yin Yoga accesses the liver meridian line along the inside of the legs. To come into the pose, elevate your hips on a folded blanket, open your legs wide until you feel a tugging on the tissues of your inner thighs and groin, fold forward and rest your head on a bolster. We will hold the pose for 3-5 minutes. While we are in the pose we can enjoy chocolate that is actually good for you during your period. 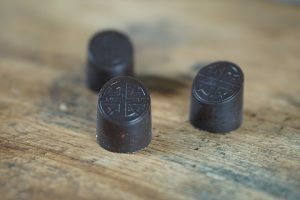 This dark chocolate from Chocolate Tonic, has herbs that will help with cramping, breast distention, mood, and menstrual headaches. If you live in Victoria BC you can get these chocolates at Mother Nature’s Market and Deli on Cook St.
Let me know in the comments what kind of chocolate you like best around your period. If you like chocolate around your period press the thumbs up button. If you know somebody who could benefit from this video, please feel free to share it with them. Subscribe for more videos like this every Wednesday at 9 am PT. For 7 days of yoga for hormonal balance including full length yoga videos, 5 minute how to videos with quick yoga demos to regulate your hormones and glands, recipes and quick self care routines enter your email address below.